Imagine being so stupid you think our entire system could be swayed by a group of Russians allegedly spending a few million dollars in the 2016 election but Hillary Clinton's backers spending over $1 billion had little to no effect. 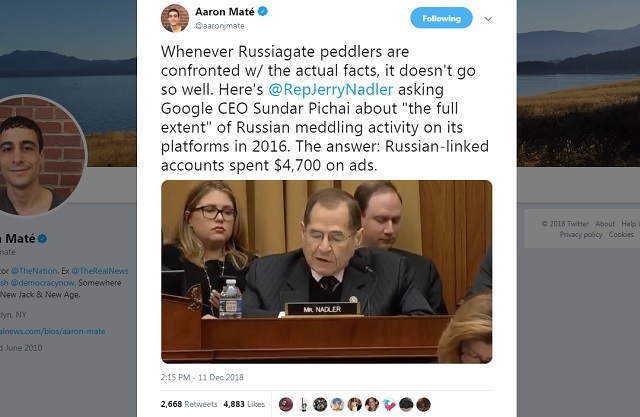 Google CEO Sundar Pichai revealed that the "full extent" of so-called Russian meddling activity that took place on the platform during all of 2016 was $4,700 spent on some digital advertisements. "We have � we undertook a very thorough investigation, and, in 2016, we now know that there were two main ad accounts linked to Russia which advertised on Google for about $4,700 in advertising," Pichai responded.